This photography workshop will take you into the hidden places of the Cusco Valley, deep in the Andes, without forgetting one of the new seven wonders of the world - Machu Picchu. Photographing through the streets of San Blas in Cusco, visiting the community of Cuncani lost in time in the Valley of Lares. We will take you to the seven colours rainbow mountain but off the beaten path, where few tourists go and locals live their daily lives and activities without interruptions. Next, the 7 lakes trek of Ausangate Mountain. Meet the local Quechua Community. Juan's family will be our hosts. Return to Cusco and jump on a quick flight to Puerto Maldonado in the Amazon rainforest. We will take you to an indigineous community where you'll meet a native family happy to share their knowledge and traditions. We compliment this with the local wildlife. From birds to caimans, tucans, capibaras. The variety is immense in this dense region. This Photography Expedition will provide you workshops on portraiture, landscapes, wildlife, lifestyle, documentary and night photography. After everyone finally reaches Cusco (3500m, 1h20 flight from Lima ), and gets settled in their hotel room, we will have a short walk in the streets of the old capital of the incan empire. Limbus bar will host our meeting point. This is the first opportunity to get to know all the group members, discuss some photography and have a briefing about our trip. We visit a local market where amazing andean people are open to portrait and documental photography. Later on, enjoy the amazing reflections on one of the most stunning lakes of the sacred valley, Lake Huaypo. 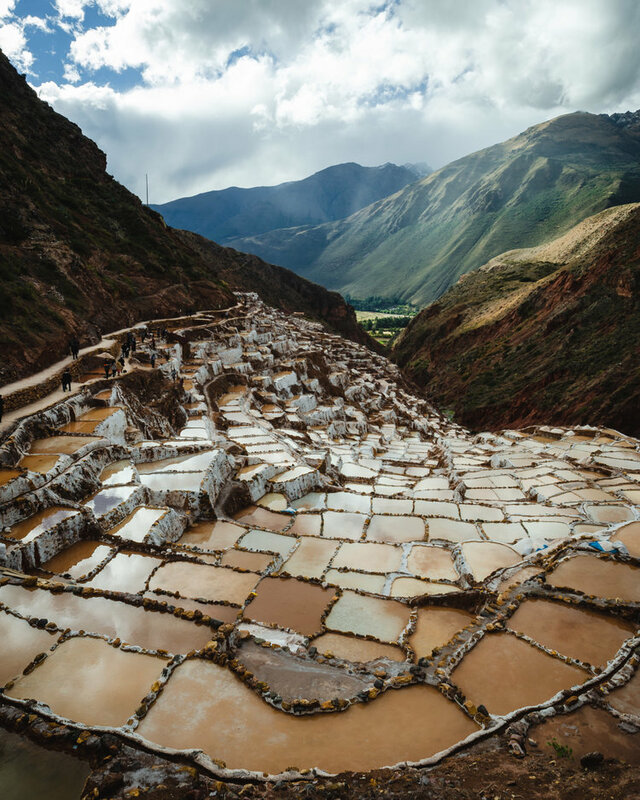 We will finish with the last sun rays over the salt mines of Maras and drive to Ollantaytambo. Take the famous train through the sacred valley to the town below Machu Picchu - Águas Calientes. Morning and mid afternoon reserved for the lost city of the Incas - Machu Picchu. Enjoy 2 hours with a local guide who will explain everything about this archaeological location and then you will have plenty of free time for your photography. We will take the train back to Ollantaytambo and then a private transport to Calca where we will spend a relaxed night in front of the river, lost in the Sacred Valley. We leave Urubamba around 8am. Stop at the local market of Calca for a portrait session with the local Quechua ladies and try some fresh peruvian specialties after breakfast. Here we can also buy some bread for the community we later visit. After the market, we head into deep into the Lares Valley. Expect an hour of scenic drive in the most impressive landscapes that you will see in the Sacred Valley. We can do a few short stops for pictures as time is of the essence here. Once in our wonderful community, our host Bernardiño will be waiting for us with his family and wife to have a welcome tea. After that we will visit the school. Kids will make you feel like part of their community. After a traditional peruvian meal with Bernardiño's family in his beautiful traditional house we will begin our afternoon drive up to the lakes of and enjoy our landscape and wildlife photography workshop. This area is surrounded by stunning valleys and mountains full of Llamas, Alpacas and their masters - quechua shepards. Around 5pm we will start the return trip to Cusco. It's time for dinner and some very important sleep hours. 5th Day - Cusco. City tour, Street Photography. Excursion through the city of Cusco with a local guide. He will take us to a traditional local market, the main square, some beautiful churches and a couple of Inca palaces. In the afternoon, you will enjoy a Street photo tour with your photography guides. Early in the morning we will go to the non touristic side of the famous Rainbow Mountain. The normal tourist route brings about 1000 people per day to the most common tourist path of the famous mountain. However (thank God) most people do not know that it is possible to visit the other side of this mountain range. That is exactly where we will take you, deep into the Andes. We will spend the night close to the Ausangate mountain in a Quechua community. Enjoying the hot springs is a must in this location and if the weather permits it, get ready for an Astro-Photography night workshop. 7th Day - 7 Lagoons, Quechua community. 7 lagoons await us during the morning. Horse-ride under the majestic Ausangate mountain (6,384m). Meet the local horse trainer and travel with them through 7 incredible lagoons with different shades of blues and greens. An incredible opportunity to develop your landscape photography skills. Get ready for environmental portraits of our Quechua guides. They love to be photographed and turn into superstars when they see a camera! We return to the community for lunch and a good time with the locals. You can again relax in the hotsprings before departing to Cusco. 8th Day - Puerto Maldonado, Amazon. Around 10am, we will take you to the airport in Cusco. Our flight time to Puerto Maldonado should be around 30 minutes. We will take the day to settle in our lodge on the edge of the Madre de dios River. After few hours of rest, we will get on our boat to get to our Sunset point. Afterwards we will start looking for caimans and Capibaras. 9th Day - Boat through the Amazon. Wildlife. Indigenous Community. Early in the morning we will head to the Parrot Clay lick. For parrot enthusiasts, visiting a macaw and parrot clay lick is guaranteed to be one of the most memorable highlights of your trip to the Amazon rainforest.The Tambopata National Reserve in south-eastern Peru protects the world’s largest known parrot clay lick and the area contains the highest known concentration of them in the world. A claylick (locally known as colpa or collpa) is a naturally forming wall of clay on a riverbank caused by erosion from the river. Every morning at around dawn, macaws, amazons, parakeets, parrotlets and other parrots flock to these clay licks to eat clay, sometimes hundreds at a time, creating an incredible wildlife spectacle. Later on we will head to the Native Matsiguenga family. In the Matsiguenga house we will learn about the uses and the importance of the forest for the local habitants, learn a bit of their culture and develop native skills in the use of bows and arrows. We will have the opportunity to practice our portrait skills. During that day we will also have the option of visiting the Monkey Island. We will head to the Sandoval Lake (Tambopata Reserve) where we will have a 5.5 km walk in the jungle with many opportunities to observe monkeys, snakes, tarantulas and wild pigs. When we reach the shores of Lake Sandoval, take a boat to navigate on the lake and keep looking for local fauna such as alligators, giant river otters, parrots and a diversity of birds. This is our last day in the Jungle, it is time for us to fly to another kind of jungle… Lima. We will have a last sunset photography session in the Malecon by the ocean and also enjoy our last dinner with the group. This is where our Photography trip ends. Anyone staying in Lima for a few more days can enjoy the advices of our guides or our hotel recommendations. Time to fly back home. All transport starting from Cusco or Lima. Private taxi with the amazing Sir Ronal. Train tickets to and from Machu Picchu. Photography workshop throughout the route. All boat rides in the Amazon Jungle. Local guides in Cusco, Quechua Communities and Jungle. lunch with the local communities in Cuncani, Ausangate and Puerto Maldonado (5 lunch meals). constant photography support from the two founders and guides. Lots of insight from amazing local peruvian guides that will join us on the most important tours. Flights - Cusco to Puerto Maldonado and Puerto Maldonado-Lima. Extra BONUS : Amazing drone footage from your Peruvian Expedition with us. Clothes for the cold of Cusco. Rain coat in case of bad luck. Long and light clothes for the jungle treks. Good comfortable shoes to walk. Sharp eyes and your smile.